The 47.25 metre new-build sailing yacht Troy has been listed for sale by David Seal at Northrop & Johnson. Currently under construction at the Esenyacht yard in Turkey, she will feature a steel hull with a composite superstructure. Her exterior and interior styling is by Tim Saunders in collaboration with Esenyacht’s in-house team. 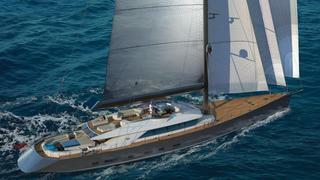 Designed for performance racing and as a luxury cruising yacht, Troy will accommodate 12 guests and nine crew members. The guest accommodation layout is configured as a master suite, two generous double cabins and two twins, all with en suite bathroom facilities. The interior is a rich symphony of golds and precious woods, all based upon the Trojan theme. Mosaics of Murano glass inlaid with six different types of gold leaf adorn the door frames, and an artist has been commissioned to engrave an intricate scene of Troy into the gold leaf that coats the guest corridor. A world cruising superyacht with a truly unique design and built to the highest possible standards, Troy will be available for delivery in late 2015 or early 2016. Available to view at the yard in Bodrum, Turkey, Troy is asking €29.5 million.